Image Size: 24"w x 23"h.
“Remembering my ancestors” is the phrase spoken to John Buxton (who painted "The Ceremonial Pipe & Artist Benjamin West") by a Seneca friend of the Iroquois nation who made the replica of a calumet, or ceremonial pipe, which is shown in this painting. This contemporary Seneca honored his Native American heritage as he created this masterful quillwork inspired by their original pieces. In the painting, one of the Iroquois presents a calumet to the curious who are gathered around a flat rock fire pit. One of the men holds common clay, or “tavern,” pipes that were traded with the white men. Meat hangs on the fire. This might be a common public scene on a warm afternoon in eastern Pennsylvania. In the right background, the eighteenth-century American-born artist Benjamin West observes with his sketch pad. Years later, several of West’s paintings, including Portrait of Colonel Guy Johnson, featured a calumet just like this that he had acquired in his early Pennsylvania days. The 40" x 42" original oil painting by John Buxton sold at the Autry Museum’s Masters of the American West 2016 invitational exhibition and sale. John was born and raised in the small town of Oxford, NC. From childhood, he excelled at drawing and painting. After two years of general college in his home state, he traveled to Los Angeles to earn his BPA degree in illustration from the Art Center College of Design. John was a successful illustrator for 31 years, working in Detroit, Cleveland and finally Pittsburgh where he met and married a cute receptionist named Noralee. During this period, Buxton worked for several advertising studios but in 1983, he formed John Buxton Illustration, Inc. On of his clients was the National Geographic Society (book division and World magazine) where John developed a fascination with their dedication to documentation and research, insuring that all artwork was as correct as possible. This impressed on him the realization that most of his adverting illustration had been “throw away art” and perhaps there was another type of art that may be held in higher regard. Thusly, in 1994, Buxton put aside the requests of Art Directors to begin painting subjects more to his interests and hopefully of more validity. He wasn’t quite sure, however, with so much to choose from, just which subject matter he was going to paint. John soon began exhibiting his new oil paintings, placing two works in the Birds in Art Show at the Leigh Yawkey Woodson Art Museum. These two paintings were later reproduced in The Best of Wildlife Art, Volume 2 by Rachael R. Wolf, published by Northlight Books. John also tried the National Park Service’s annual competition, Art for the Parks placing in their Top 100 and included in their traveling show. The Society of Animal Artists elected him to membership and invited him to exhibit in their national snows. He also exhibited with the American Academy of Equine Artists before settling into his true niche—Historical Art. 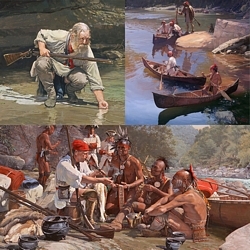 Buxton’s historical images of the 18th century depicting scenes from the birth of our Nation, allowing “witness” to momentous events or experiencing everyday life on the frontier allows American history to come to life. His compassion and enthusiasm for historical accuracy has propelled him to great heights of recognition. Numerous museums and historical sites permanently display his extensively researched paintings. Several documentary files have chosen his art to enhance their programs. A program, using John’s paintings to inspire students with our heritage, was developed on disc to be distributed to schools and teachers. John’s paintings have been featured within scores of genre magazines. Feature articles have appeared in US Art magazine, Westsylvania magazine, America’s First Freedom and more recently, Art of the West magazine in its January/February 2006 issue featuring John’s paintings and insight into their creation. The Artists Magazine’s annual Art Competition awarded Buxton’s painting, How Many Beaver? first place in the 2005 Portrait/Figure division from over 4,000 entries. It was featured on the cover in December. In the part, most of John’s art was painted as private commissions. He endeavors to produce more paintings each year for select shows, such as The Masters Invitational at the Autry Museum in Burbank, CA, the miniature show at the Gilcrease Museum in Tulsa and the miniature show at Settlers West Gallery in Tucson. This year, John will also exhibit in the Eiteljorg Museum’s Quest for the West show in Indianapolis. He was recently accepted into membership of The Oil Painters of America. He lives in Pennsylvania with his wife Noralee. They have two children, Bryan and Megan and will soon be blessed with two new grandchildren.